Globally, gold fell 0.11% to $1,220.80 an ounce and silver by 0.21% to $14.46 an ounce. 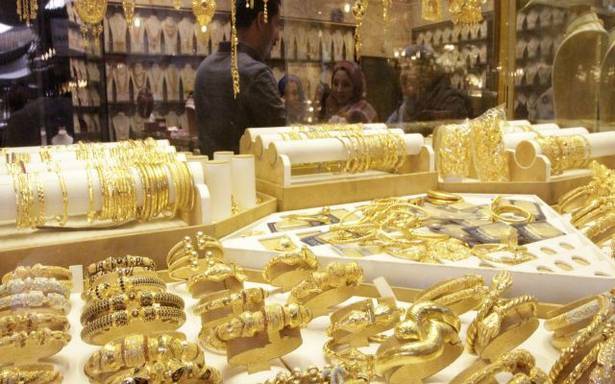 Gold shed ₹50 to ₹32,100 per 10 gram at the bullion market on Monday, owing to slackened demand from local jewellers amid a weak trend overseas. Silver, too, weakened by ₹50 to ₹38,100 per kg. Traders said fall in demand from local jewellers and retailers and bearish trend overseas, after comments from Federal Reserve officials showed caution over the global economy, prompting investors to reassess the pace of future U.S. interest rate hikes, mainly kept pressure on gold prices. In the national capital, gold of 99.9% and 99.5% purity fell by ₹50 each to ₹32,100 and ₹31,950 per 10 gram, respectively. The yellow metal had gained ₹135 on Saturday. Sovereign gold, however, remained unaltered at ₹24,800 per piece of 8 gram. In step with gold, silver ready eased by ₹50 to ₹38,100 and weekly-based delivery by ₹3 to ₹37,020 per kg. Silver coins, however, continued to be traded at previous level of ₹73,000 for buying and ₹74,000 for selling of 100 pieces.